It was great, clean and very quiet.We were happy to find this place for resting. 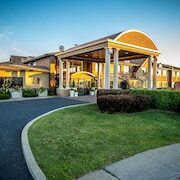 Where to find St-Bernard-de-Lacolle hotels near an airport? 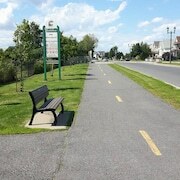 Where can I find hotels in St-Bernard-de-Lacolle that are near tourist attractions? Visitors to Montreal - Monteregie will find just 1 accommodation option within a 0.1-kilometre (0.06-mile) radius of St-Bernard-de-Lacolle's downtown area, so it's worth booking a room as soon as possible. The Hotel St. Bernard is nearest to the middle of St-Bernard-de-Lacolle and the only hotel within a short drive. The Motel Iberville and the Motel Montgolfière JP are accommodation options to investigate. 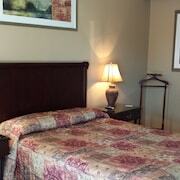 The Motel Iberville is situated 35 kilometres (21 miles) away from the main part of St-Bernard-de-Lacolle. The Motel Montgolfière JP is 30 kilometres (18 miles) away. The Domaine Pourki is another great option. It's situated 20 kilometres (14 miles) from from the center of town. The larger Montreal - Monteregie area is definitely well worth seeing also. Spend time at Montreal - Monteregie's old towns and churches or enjoy the region's forests, rivers and lakes. Common pastimes in this particular part of Canada include skiing, cross-country skiing and ice skating. Montreal is 50 kilometres (31 miles) to the north of St-Bernard-de-Lacolle and is home to the Notre Dame Basilica and Saint Joseph's Oratory. Should you wish to stay in Montreal, be sure to check out the Auberge de La Fontaine and Ritz-Carlton, Montréal. 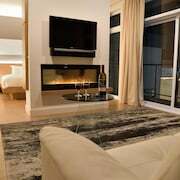 Or, you could consider staying in Saint Laurent Boulevard, 55 kilometres (33 miles) to the north of St-Bernard-de-Lacolle, where you can choose from the Hotel Le St-James Montréal and W Montreal. Whether you're just passing through or staying in Saint Laurent Boulevard, set aside some time to visit the L'ile Notre -Dame Beach and Olympic Basin. Before you say goodbye to Montreal - Monteregie, ensure you catch local game. Visit Olympic Stadium to the north of St-Bernard-de-Lacolle. For those who are keen on staying nearby, make a reservation in the Loft Hotel or Auberge Le Pomerol. 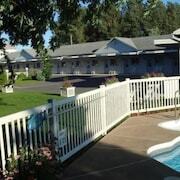 If you are flying into or out of Plattsburgh International Airport and would like to stay nearby try Comfort Inn And Suites or Holiday Inn Plattsburgh - Adirondack Area. 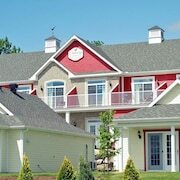 Are there hotels in other cities near St-Bernard-de-Lacolle? 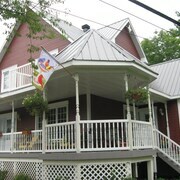 What other types of accommodations are available in St-Bernard-de-Lacolle? Explore St-Bernard-de-Lacolle with Expedia.ca’s Travel Guides to find the best flights, cars, holiday packages and more!